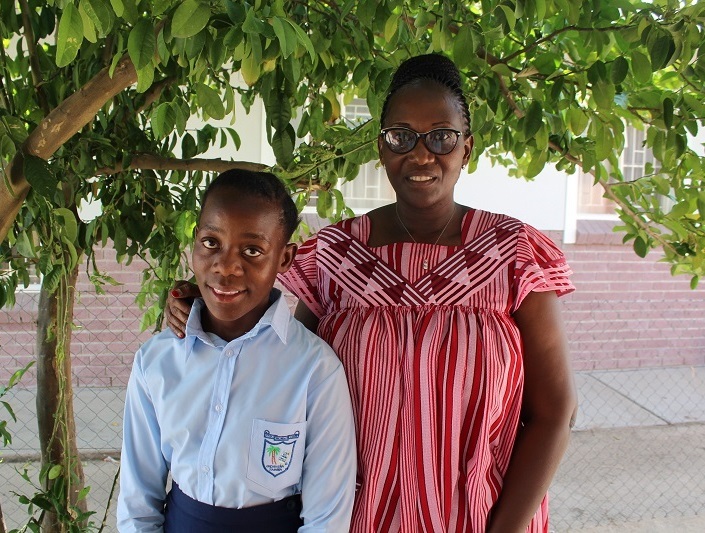 Nothando* and her SOS Mother Emilia have a special bond. The two met when Nothando needed a loving home and Emilia, a newly employed SOS mother, waited to receive her first child. Both of Nothando’s parents died when she was two years old, and so she went to live with her maternal aunt who had seven children of her own. The large family was already struggling and barely making ends meet. They could not give Nothando the support she needed after losing both her parents. “I was very happy to see Nothando as the first child in my SOS family house,” Emilia says. “But she was sad and cried when her aunt left her in my care. The assistant mother and I welcomed her with a homemade cake, some drinks and sweets. We had a small party with my colleagues, as there were very few children in the SOS Children’s Village Ondangwa at the time, for it had just opened. I lived with Nothando for six months before I got my second child,” Emilia adds. “Nothando was about nine years old then, and so I explained to her that I would be her new mother, and that I would take good care of her. From there on, our bond grew and got stronger each day,” she recalls. “I have formed a deep bond with my SOS mother whom I respect and love so much,” says Nothando. “Emilia is a wonderful mother, who puts her children’s needs before her own. My mother loves me and she encourages me to study hard. She supports me in my studies and always makes sure that I have all the resources I need like textbooks and other school materials. She wants me to become someone important one day. I like that she loves singing and she is a member of the town choir,” Nothando explains. Today, Emilia cares for 10 children in her SOS family. 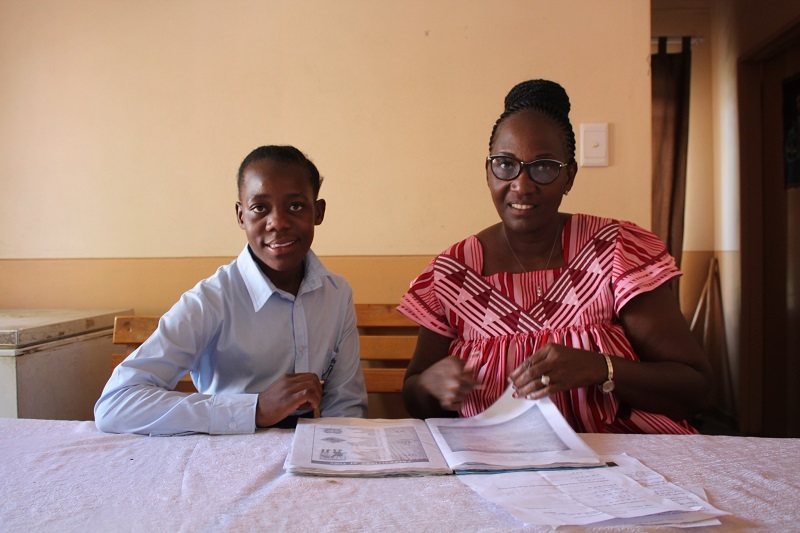 She is proud that Nothando has become an amazing young adult, who gently takes care of her younger siblings and represents the interests of other children as a member of the youth committee. “As a mother, the most important thing that I have taught Nothando is to respect elders. I have also taught her to love her siblings, to always give generously, as giving is sowing a seed to harvest later, to be humble, and to be content with what she has,” explains Emilia. With the support and assurance Nothando has received from her SOS family, she has developed her unique individuality and found her passion. For fun, Nothando plays soccer, and like her SOS mother, she also loves to sing. She is in the SOS youth choir. She wrote her school exam last year and passed with the highest marks, making her the top student in her grade. She is now in high school, and if she keeps posting such good results, she will make it to university. “Nothando is a responsible and focused child who is determined to achieve her goals,” Emilia adds. “She is open and shares her dreams and fears, which makes it easy for me to communicate and guide her. She is a well-behaved child and is a good example to her SOS siblings. Nothando is not influenced by her peers, she always checks with me first when uncertain,” says the proud mother. Canadians wishing to help young people realize their full potential are encouraged to sponsor a child, sponsor a Village or make a one-time donation. Your support will help transform the lives of the most vulnerable.